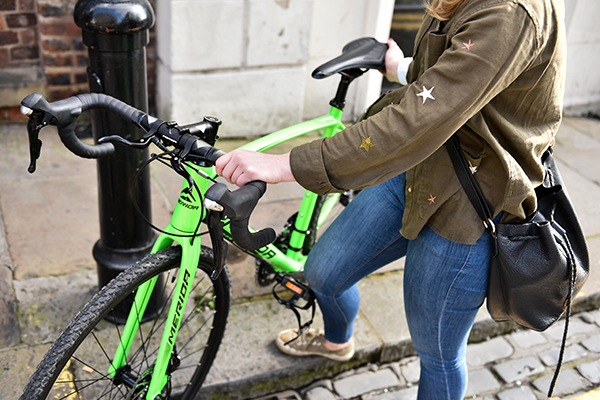 Cycle to Work Day is the perfect opportunity to try out commuting by bike. Thousands of others will be cycling to work that day – some for the first time, some because they always do – so you won’t be on your own. And there are prizes to be won! Cycling is good for you because it reduces stress and provides aerobic exercise. It’s convenient because you don’t get stuck in traffic jams or have trouble parking. It saves you money. It’s good for the environment. It’s easy too. Don’t be misled into thinking you must have an expensive bike, special clothing, or a high level of fitness. All you really need is a bike – any bike. If you’ve got a bike gathering dust in the shed or garage, it may only need the tyres pumping up and the chain oiling to make it ready to ride. But be sure to check it over to ensure it’s safe. If you’re not confident doing that, take it to the bike shop. Check with your workplace to see if there’s somewhere safe to leave your bike, ‘safe’ means ‘behind a locked door’. If there isn’t, you’ll need a lock. Really good ones are expensive but you can buy an adequate D-lock for little over a tenner. Normal clothes are fine for short rides at an easy pace. Choose footwear with a good grip on the pedals; you can always take unsuitable work shoes in your bag. If the saddle is narrow, avoid trousers with thick seams as they can dig in. To keep your right trouser leg off the oily chain, you can: tuck it into your sock; use an elastic band; or buy some cycle clips. If you don’t feel comfortable riding without a helmet, buy the cheapest in the shop that fits comfortably; it will have passed the same safety tests as the others. Don’t automatically take the same route by bike that you’d use by car. Quieter backstreets or cycle tracks are more pleasant and can be quicker even if they’re less direct. Plot a route online using CycleStreets and/or Google Maps. The algorithms aren’t perfect. CycleStreets will sometimes send you along bumpy bridleways, while Google Maps often includes busy roads. For on-the-go sat nav instructions, use the Bike Hub app or the Google Maps app on your smartphone. Otherwise, just test ride the route(s) the weekend before. Don’t rule out cycling because it’s too far. You can take your bike part of the way by train or car. Give yourself plenty of time to get there. Ride assertively: if you behave like traffic, you’ll be treated like traffic. Much of this is to do with road positioning – don’t hug the kerb. Don’t ride up the inside of buses or lorries. If you’re not comfortable with a junction, get off the bike and walk around it. There are more tips here. Keep going! You’re not committed to cycling to work every day. You could ride two or three days or week, or only when the weather’s nice. Build up from there. Treat yourself to a new bike and equipment. You can save at least 25% on the purchase price and spread the cost over 12 months if you use Cyclescheme. Your employer needs to be signed up. If they’re not, invite them.